Take charge of the hedges with Toros PowerPlex 24 Hedge Trimmer. This cordless, 40-volt MAX hedge trimmer has Toros exclusive blade design that grabs on to the hedge and holds it in place for a more efficient cut. The PowerPlex T90 battery offers a lot of available power, and the trimmer can handle it with a 20% thicker blade than Toros 20V Max hedge trimmer. The one-touch button rotates the handle 90 degrees making it easier and more comfortable to switch between horizontal and vertical cutting. With 90 watt-hours, the T90 battery provides up to 60 minutes of run time and this battery charges in approximately 60 minutes in the quick charger. Battery and charger not included. Take charge of the yard with Toro PowerPlex tools. Part of ECHO's best-in-class X Series line, the HC-2420 features a 21.2 cc professional-grade, 2-stroke engine and front-facing exhaust. The 24 inch double-sided, double-reciprocating blades provide long reach. The 5-position rotating handle provides a variety of cutting positions. Powered by a 58V lithium-ion rechargeable battery, the all-new Jonsered HT24i battery-powered hedge trimmer delivers the power, performance, and runtime typical of traditional gas-powered tools, without the hassle of mixing and storing fuel. Featuring durable, stainless steel, dual-sided serrated blades for clean-cutting performance in swaths up to 24-inch wide and limbs up to 3/4-inch diameter. With other impressive features like instant push-button starting, variable speed control and integrated power boost technology, this quiet, lightweight, and environmentally friendly hedge trimmer is perfect for trimming all sorts of shrubs and hedges. Powered by a 58V rechargeable lithium-ion battery, the all-new Poulan Pro PRHT22i battery-powered hedge trimmer delivers the power, performance, and runtime typical of traditional gas-powered tools, without the hassle of mixing and storing fuel. Featuring durable, stainless steel, dual-sided serrated blades for clean-cutting performance, it quickly cuts in swaths up to 22-in wide for limbs up to 3/4-inch diameter. The ergonomic tri-handle design provides controlled cutting in all angles and positions. With a built-in battery power meter, it's easy to monitor power usage, and the handle-mounted, easy-to-view battery power indicator guarantees you'll never run out of power mid-task. With other impressive features like instant push-button starting with no pull cord, variable speed control, and integrated power boost technology, this quiet, lightweight, and environmentally friendly hedge trimmer is perfect for trimming all sorts of shrubs and hedges. 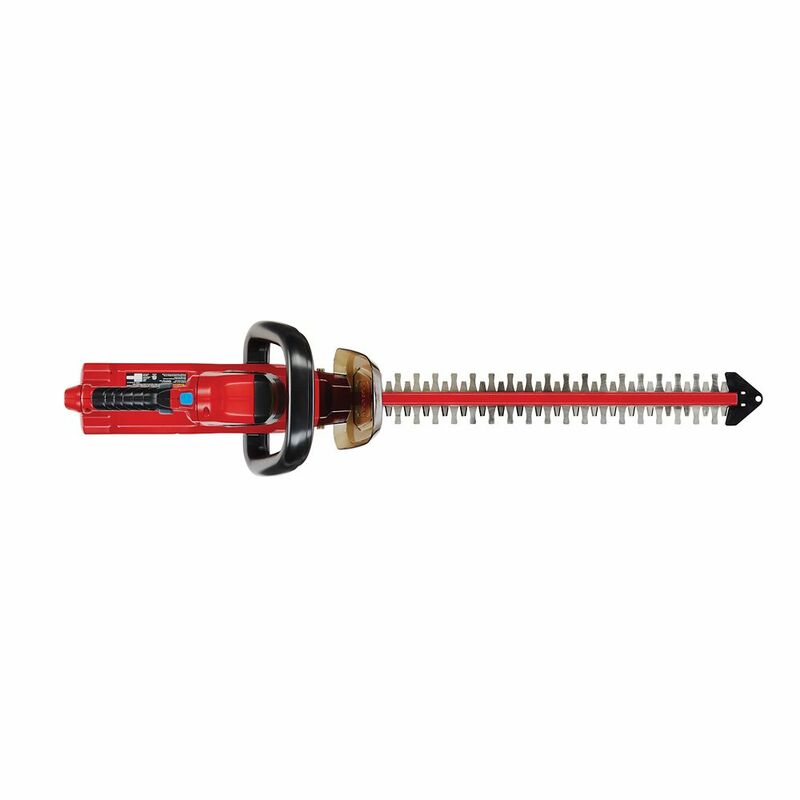 PowerPlex 24-inch 40V Max Hedge Trimmer Take charge of the hedges with Toros PowerPlex 24 Hedge Trimmer. This cordless, 40-volt MAX hedge trimmer has Toros exclusive blade design that grabs on to the hedge and holds it in place for a more efficient cut. The PowerPlex T90 battery offers a lot of available power, and the trimmer can handle it with a 20% thicker blade than Toros 20V Max hedge trimmer. The one-touch button rotates the handle 90 degrees making it easier and more comfortable to switch between horizontal and vertical cutting. With 90 watt-hours, the T90 battery provides up to 60 minutes of run time and this battery charges in approximately 60 minutes in the quick charger. Battery and charger not included. Take charge of the yard with Toro PowerPlex tools. PowerPlex 24-inch 40V Max Hedge Trimmer is rated 5.0 out of 5 by 5. Rated 5 out of 5 by HappyHedger from Fantastic trimmer! It came double boxed, so no damage. The... Fantastic trimmer! It came double boxed, so no damage. The package arrived earlier than promised. I rid of my corded trimmer to go cordless and will not go back. This trimmer has more than plenty of power both in terms of strength and longevity of use. Cordless cut my work time in half easily. Rated 5 out of 5 by EmaC from Very good hedge trimmer, for an excellent price The PowerPlex 24-inch 40V Max Hedge Trimmer allows me to clean up very fast the bushes on a steep slope. The trimmer is easy to use and has been working very well over the last two months. Rated 5 out of 5 by Wandoo from I have never used a hedge trimmer before. I think... I have never used a hedge trimmer before. I think this one works perfectly. No problems at all. Battery is very easy to take in and out and charge. I cut quite a lot of bushes and never ran out of battery power. It is a little heavy, but they probably all are. Rated 5 out of 5 by RayH from Product works well Based upon my satisfaction with Toro products over the years, I purchased this new 40 volt battery powered hedge trimmer and was delighted with its performance. So much so, I also bought a blower and week wacker, using the same 40 volt batteries. This is a great series of yard products for homeowners!